The Woodshed Orchestra mashes up classic dance styles from all over the world into a soulful celebration. Legendary Toronto drummer Dave Clark (Rheostatics, Dinner is Ruined, The WoodChoppers Association, Gord Downie and Charles Spearin) pilots a five-piece horn section, four-piece rhythm section and full-ensemble vocals through New Orleans Funk, 2nd line and Jazz, R&B, Ska, Soul, Reggae, Punk, Rock n Roll, Blues, Country, Surf Rock, Neo-Greek, Ranchero, Polka, Disco, Samba, Afro-Pop, Waltz, New Wave, Cajun, Tex-Mex, Power Pop, Klezmer, Torch Ballads, Tango and Calypso, in an extraordinary celebration. This band is a funky, uplifting and joyful ride every time it plays. Weʼre true blue friends of yours. We come here in peace to bring all relief from the troubles on your mind and the everyday grind. Weʼre here to light a spark of love and joy inside your heart. Dave Clark has been immersed in music almost since he could walk. In 2005 he created The Woodshed Orchestra with passionate, courageous and joyful friends to play the music from his original songbook. A songbook that now contains over 200 original tunes. The Woodshed has done them proud. We are for people who like to celebrate life by singing and dancing. Dave Clark has written a wide variety of eclectic original classic dance tunes that are not restricted by genre or fads. The band is a powerhouse that can play this high-energy music for up to four hours at a time. Clark leads the band Levon Helm-style from the drumkit, singing and sharing the lead vocal duties with every member of the band. Absolutely everyone in the band sings along as much as possible. The Woodshed Orchestra is capable of improvising and turning tunes around on the spot to create unique frenzied moments that leave audiences awestruck and excited. The band can play out as a electric band with drums, guitars, horns, keyboards and vocals and just as easily break out into a New Orleans-type 2nd Line brass band, a Klezmer crew or Tex-Mex band of up to eleven players. Folks who come to Woodshed shows to dance and sing along joyfully with the band. Weʼre like your best friend who can make you laugh when youʼre feeling down. Weʼll make you shed tears of joy cause our love abounds. Weʼll get you celebrating every time we make our fonky sounds. Thatʼs who we are. We value the soulful heartfelt connections we make with our audience. 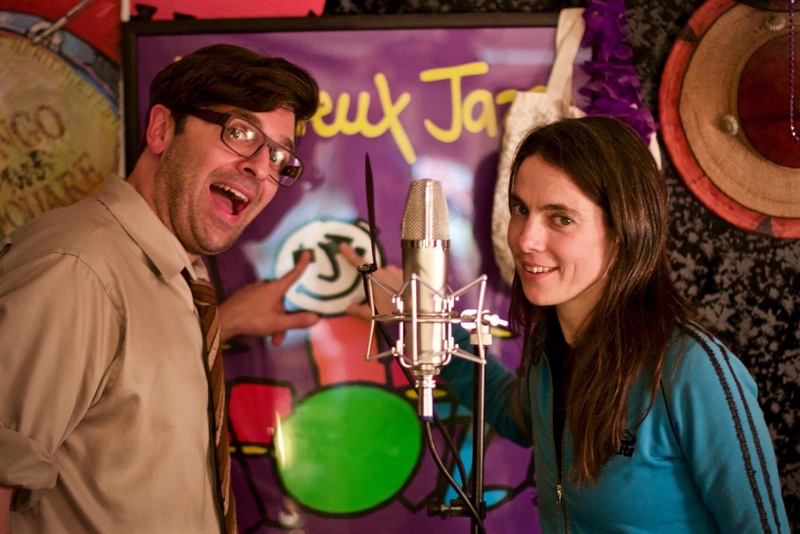 The Woodshed Orchestra wants to get you dancing, singing and shouting out for joy. The Woodshed Orchestra guarantees to play their music with all the love that they have in their hearts every time they take the stage. The Woodshed Orchestra will uplift you. The Woodshed has toured the West Coast and East Coast of Canada, all over Ontario and in Quebec, headlining clubs, concerts and main stages at festivals from Hillside, Discovery Coast, TO Jazz fest, Guelph Jazz Fest, Cultura fest, Nuit Blanche to Music Des Traditions Du Monde in PQ down to playing sold out shows down in Brooklyn NYC. What are some of our gig highlights? The Woodshed Orchestra has played with Karl Denson's Tiny Universe (USA), Etran Fiatawa (Eritrea), parade jammed with "The Screaming Eagle of Soul" himself, Mr. Charles Bradley (USA) and performed with musical madman Friendly Rich Marsella (Can). 2015 – “Guest Book” - Featuring Ron Sexsmith, Sarah Harmer, Kevin Breit, Dani Nash, Amanda Rhaeume, Suzie Vinnick, Sam Cash, Friendly Rich Marsella, Amanda Balsys, Victor Bateman, Stephen Fearing and Myk Freedman. 2018 - "The Leonard Cohen Sweet!" - Featuring the Woodshed Orchestra with Friendly Rich & the Lollipop People. *We’ve even got an impromptu recording with Jon Langford of the Mekons (USA/UK) made at Sappy Fest – Sackville NB. What are some of our video highlights? Our loving ode/video "Geddy Lee" to Geddy Lee of Rush got the thumbs up from Geddy himself! Our video "Love Letter to New Orleans" got the thumbs up from legendary New Orleans drummer John Vidacovich (Dr John, Professor Longhair, Astral Project). Our "Leonard Cohen Sweet!" videos By Adam ck Vollick are top of the pops! Who is usually in the band? The Woodshed Brass Bandits at the Firelight Fest Parade 2016! The Woodshed leads the Firelight Fest parade 2016! Heavyweights Brass Band/Woodshed Orchestra "Mash-Up"
The Woodshed Orchestra with Ron Sexsmith - "Starry Eyed"
The Woodshed Orchestra with Amanda Balsys - "U Don't Have 2 Cry"
The Woodshed Orchestra with Sarah Harmer - "This World Needs Love"
The Woodshed Orchestra w/ Pete Bowers play "Dedication!" The Woodshed Orchestra & Laura Repo - "Sleepy Baby"
#CCLAexpressyourself - Nathan Lawr and The Woodshed Orchestra performing "Walking on Thin Ice"
Want the Woodshed to play your wedding, party, club, concert, festival, Bar (Bat) Mitzvah, BBQ, cottage, Birthday, divorce party, wake? "Dave Clark and the Woodshed Orchestra have this amazing ability to make real life sound like the best musical in the world. I can't name another group of people who sound so joyous together, get to some essential truths about living, and dance their pants off doing it. Love them. They're my favourite parade." – Vish Khanna – CBC Radio3 – Exclaim Magazine. 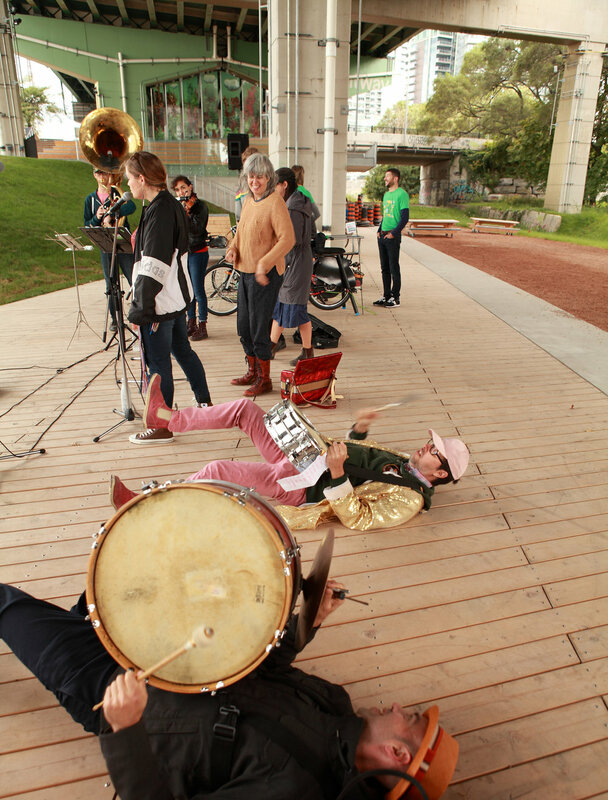 “Most recently, at the 2011 edition of our festival, I hired Dave’s excellent Woodshed Orchestra to perform as part of our all-night Nuit Blanche event. Their late night concert drew a large and energized crowd that danced, sang, and celebrated alongside the joyous performers. The positive and uplifting energy of the group’s music, in fact, acted almost as an anthem for the spirit of the Guelph Jazz Festival’s Nuit Blanche 2011.” – Ajay Heble, Artistic Director, The Guelph Jazz Festival, Guelph, Ontario, Canada. “I’m listening to the Woodshed Orchestra’s self-titled new album for the first time as I write this and it’s a riot, too. Funk, soul, country, New Orleans blues, slinky jazz, Stones-y rock n’ roll and just about everything else you can imagine impeccably played and rendered in several garish shades of joy. Smiles abound.” – Ben Rayner – Toronto.com. “Simply put, the Woodshed Orchestra was a key component in making SappyFest Six the best, and most successful event we've ever produced. From acoustic marching band parades to their explosive and endearing set on the Mainstage, the group was delightfully everywhere, all weekend. They are up for anything, always, with a smile and courtesy.” – Paul Henderson, Creative Director, SappyFest, Sackville, New Brunswick, Canada. 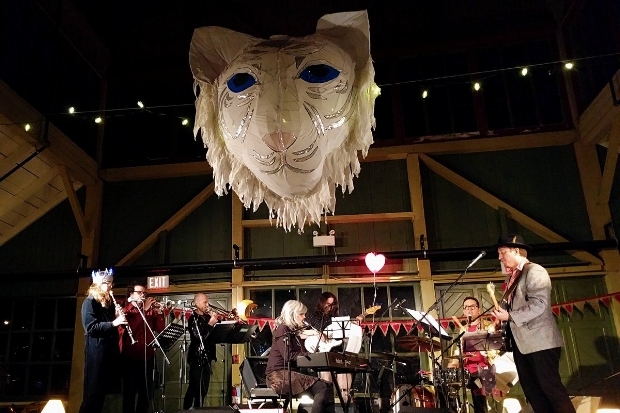 “The Woodshed Orchestra seems to have the knack of bringing the festival audience to celebrate en mass – they really got folks singing, dancing and creating a huge buzz…this type of band is priceless.” –Sam Baijal, Artistic Director, Hillside Festival, Guelph, Ontario, Canada. “Dave Clark is the hoser's Sly Stone and the David Byrne of the north. "Dave Clark's Woodshed Orchestra unique musical uplift blends off-kilter pop romanticism with keen emotional insights and a powerful sense of spontaneous play. This is music to jumpstart your frozen February heart." Phd. Daniel Fischlin – U of Guelph - Improvisation, Community and Social Practice. "Listening to the Woodshed Orchestra warms my soul to the core. They make my heart swell and my mind soar. It brings a smile to my face and leaves me feeling like the world's an amazing place"
For Booking and Press Inquiries, contact DAVE CLARK at 416 531 4646.